London – a busy city full of busy people and inevitably at any given moment a lot of them are hungry people, who are spoilt for choice when it comes to food. 1000’s of restaurants, cafés, and takeaways have built up businesses to meet this unending tide of need. However it is not always easy to find the right place to buy your food that specifically caters to our evolved palettes desire… so many of us use the trial and error method. We go, we buy… oh yes we like, we go back and buy more…or we don’t like, we move on to the next choice or even the next place, which is more than likely next door or just around the corner… The choices are seemingly endless and the only real limit for many of us is the contents of our wallet… but who amongst us likes to spend more than necessary for a great meal? When choosing a take-away firstly we need to decide what type of cuisine we fancy and then find a supplier of that cuisine that suits our budget… and ideally we would love for our food to be tasty, healthy and prepared with some if not total love. Well we have found out about a company that ticked all our boxes, and after sampling their wears we need to tell you about them so you can enjoy as well. A Freshly Made section that offers a range of handmade filled pasta, fresh egg pasta, pre-prepared meals, fresh sauces and award-winning cannoli, mozzarellas and sausages. A Pantry section featuring a hand-picked selection of premium delicatessen items, from a superlative truffle range through to a bakery, a wide choice of antipasti and a fantastic set of drinks to suit any occasion. This is a lot of food for £30. I ordered more ingredients than ready meals as we like cooking, but there is an extensive choice of Fresh Meals, including vegetarian options. When your food is ordered you can pick your delivery time slot. Unfortunately for some at this moment in time delivery is only offered in the London area (I really hope this will change someday soon). A lot of us eat with our eyes first and the guys at Delicatezza must for sure know this. 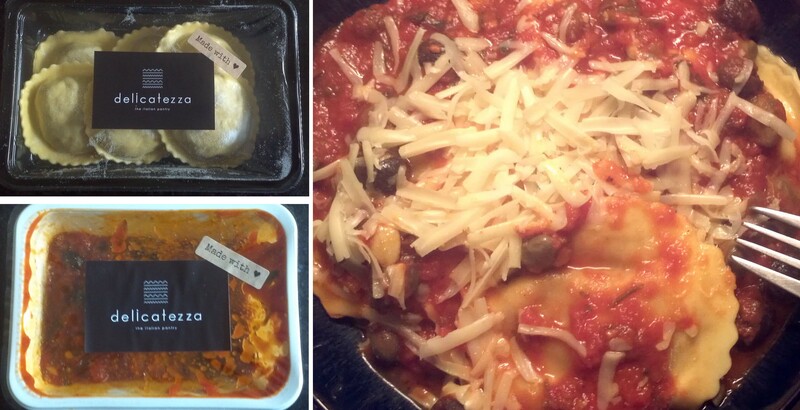 Their food looks delicious, their packaging although not fussy is very effective at conveying the sense of quality of the product inside, it is inviting and it really looks the part. Every pack is carefully labelled so you know exactly what is inside. As you would expect you can study all the ingredients used if you so wish, all best before dates and cooking instructions are clearly stated. We ate our Girasoli with Pizzaiola as they came… after cooking of course… and prepared meals using the rest of ingredients. We cooked some lasagne, spaghetti with egg and sausage (we used Lucanica Chilli for this one) and a traditional English mash, beans and sausage using Mint, Sundried Tomato & Scamorza Napoli. Yes, we did like it however… it was not what we expected, it was a big surprise. 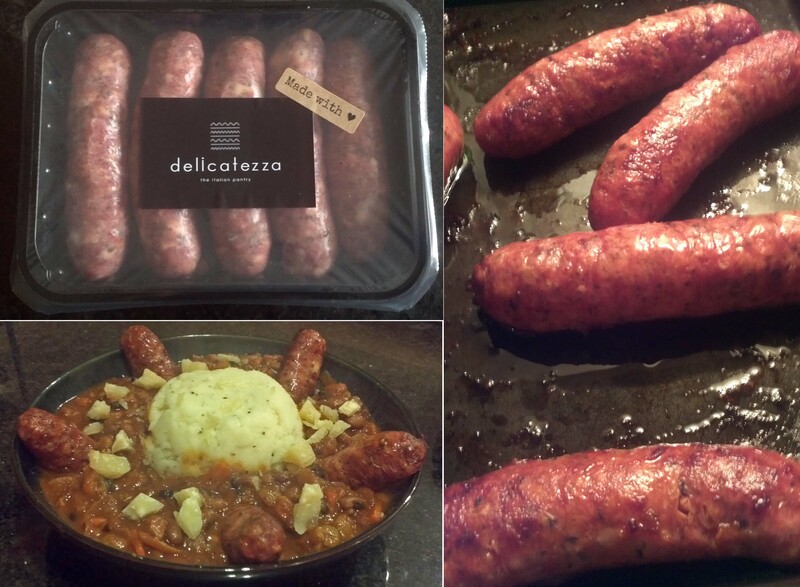 This is not actually a criticism; let me explain… We like spicy food and we do buy chilly flavoured foods such as sausages from many different sources… and although they are often marked as spicy they are never really that hot… Lucanica is! Really, it is HOT. I guess you would think I should have expect that when ordering a chilli flavour, but taking our past experiences into account I was prepare to get something maybe with a mild to moderate heat… but oh, no… Lucanica Chilli is hot, really hot! Same with Mint, Sundried Tomato & Scamorza Napoli – you can taste all the things which were used to make it, especially the mint. So if / when you will be placing your order with Delicatezza it is worth remembering that the food will taste as stated on the box! This is such an amazingly nice change; you can finally enjoy your favourite flavours. No more do you have to convince yourself that what you are eating tastes like what the label says, that it’s really is that particular flavour, even though you can’t distinguish that flavour whilst it’s in your mouth. 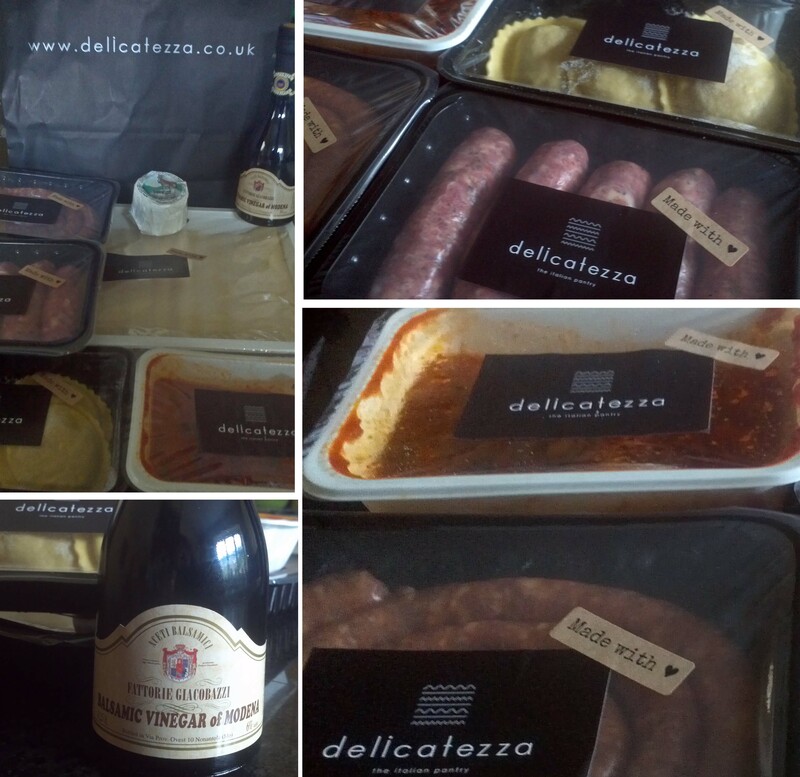 Delicatezza’s food lets you read the label and then hits you with a fully loaded express train straight from flavour town, you will be left in no doubt what so ever what you are eating, I bet even on a blind test you would know without any doubt or question. Yes, we would definitely order some more; especially given that there is so much more we haven’t tried yet. So, if you are one of those hungry Londoners out there is search of a nice Italian meal look no further… Delicatezza is there for you! Give ‘em a try Gov. I received a £30 credit to shop with Delicatezza for the purpose of this review. All opinions are honest and my own. Oh the food sounds amazeballs and I so know what you mean about things not tasting as they are meant to. Great review. I love Italian good. Fab idea! So close to London, yet so far! Live in a London borough but with an Essex postcode – arrgh! they won’t be able to deliver to me!! Sounds like a great concept and we love Italian food! Thanks for writing this review. I recently posted: Winter #LittleAdventures – Fun In The Park! Great review. Some really useful details too. I really fancy giving this a go next time I’m at my sister’s. All that lovely looking food has made me hungry. And I have only just had dinner! Looks wonderful, shame I don’t live in London. I love the simple, see through packaging. I think a window to view the delicious-looking contents is far more effective than a cardboard wrapper with a picture of it! That looks amazing! Love Italian food so this would be perfect. Great review. This look a great idea, wish I lived in London! That food looks so good and makes me want to live in London. what a selection of bits. There are a few places like that round here but nothing that looks quite as delish! That sounds and looks amazing! Oh how I wish there were something like that here!! I’m glad you found a company you like, even if the food wasn’t what you were expecting. It all looks and sounds lovely 🙂 Unfortunately we’re far from London! This is a brilliant idea and great review Agata!